In this video project I will explore two aspects of my father’s life. First his hopes, dreams and issues of emigrating from India to the United States. And secondly, on a more abstract level, why my father, growing up in British India, takes on the views and values of the colonizer. Specifically for the second exploration I will examine the many meanings of the Taj Mahal and what it meant to my father. And then ask the larger question: how does meaning get manufactured and who more importantly has the power to produce it? In the first part of this video project I will research my father’s life during graduate school. 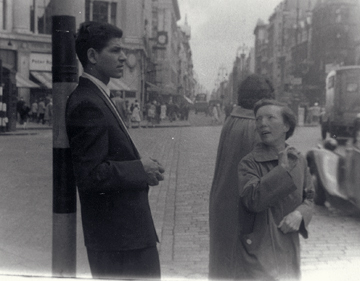 He attended the University of London for his Ph.D. from 1958 to 1962. 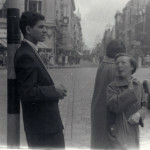 As his graduation date approached he was faced with the decision of whether to return to India or immigrate to the United States. After my father passed away I discovered over 50 of his personal letters that I plan to have translated. These letters, mostly written in Urdu, dated between 1958 and 1962 are a correspondence with my father’s family and a few close friends while he was in graduate school. The few that are in English bring up the hardships of my father being in London, working towards his Ph.D. with limited financial resources. They also convey the anxiety he suffered over his family’s demand to return to India for an arranged marriage and his personal dream of immigrating to the United States. I believe these letters will provide a greater understanding of the hopes, dreams and issues that a colonial subject faces while immigrating. In the second part of this video project I will investigate the many meanings of the Taj Mahal which will raise the following questions. Was the Taj Mahal the ideal symbol of love and devotion or was Shajahan’s intention to create the ultimate symbol of Islam? Has the Taj Mahal become a colonialist subject of appropriation? Was the monument remade, sanitized, exoticized and appropriated by the West? Is it Indian at all? On a personal level I will explore what the Taj Mahal meant to my father as an Indian. Why did he take the Western colonist’s viewpoint of the Taj Mahal? And then why do we as family choose the ultimate symbol of India the Taj Mahal to be in his head stone? How do we remake the meaning of the Taj Mahal yet again? These two aspects of my father’s life immigration and the colonial effects are deeply entwined, one influencing the other. This investigation will start to explore the paradoxes my father faced as a colonial subject: how the colonized takes on the views and values of the colonizer? And what does it mean to be born in the East and die in the West? This entry was posted in Art, Grant / Projects on July 22, 2018 by Sarina.